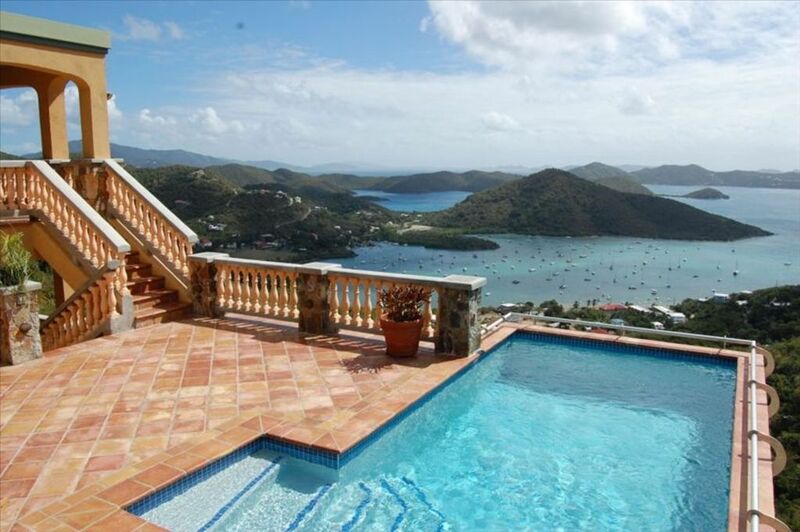 Flanders Villa is a spacious and elegant villa located in a private gated neighborhood with breath taking views of Coral Bay, the East End and the British Virgin Islands. Exceptional design and craftsmanship sets Flanders Villa apart. Traditional West Indian stonework surround the property and are complimented by beautiful planters filled with local flora.. The Villa includes 4 bedroom suites each with their own private bathrooms, the Great Room which includes kitchen, dining room, living room and powder room, a private 10x20' pool and about 1400 square feet of gorgeous Mexican tiled decking. The Great Room is perfect for entertaining guests. The entertainment center includes television, DVD player, CD player and IPOD hook-up. The cook in your party will thoroughly enjoy the brand new modern kitchen with stainless steel appliances, poured concrete counter tops and rich Jatoba custom cabinetry. The beautiful Balinese dining room table has comfortable seating for 8, or move out onto the deck for a delightful dinner poolside. The Master Bedroom is located off the Great Room with a king size Caribbean Plantation bed and it's own private bathroom, including an exquisite ceiling-free stone shower! The next three bedrooms are located a few steps from the pool deck; one suite has a king, the other two queen size beds, all have unique Balinese furniture, private bathrooms with custom built vanities and beautiful showers featuring native stone work, custom tile and incredible views. Flanders Villa was designed with island conservation and environmentalism in mind. We use solar panels for the hot water heater, the pool is treated with salt bromide, our washer is energy efficient, and we provide environmentally friendly soaps and detergents. All of the bedroom suites have amazing views and receive Trade Wind Breezes yearlong. It's a perfect location to watch the sunrise while resting in a lounger, sipping your morning coffee- or perhaps sipping a frosty frozen treat while watching the moon's reflection on Coral Bay. This is the perfect Villa for families wishing to have a comfortable and relaxing vacation, or for couples looking for that romantic get away on St John. Hi! This is my husband Josh and our son paddling around Lameshur Bay. He blames me for getting him involved with all this St John stuff! I, Suzanne, started vacationing on St John when I was in college, about 18 years ago. I took Josh here when we were dating and he also fell in love with this unique island. We bought property and started building- 2 years later we were finished-phew! We love to come down with our combined family of 2 college age boys, and our 5 and 2 year old. We certainly know the ins and outs of what to do with kids while vacationing on St John. This place is really a treasure and we are happy to share it with others. We love being on the 'quieter' side of the island! Coral Bay has beautiful beaches, restaurants and bars without a lot of the commercialism you see in Cruz Bay. Our Villa is located in a wonderful neighborhood with a mixture of rental homes and year round residents. And we have a beautiful paved road that leads to the property- a plus on St John! We have a killer view! On a clear day you can see Virgin Gorda. The views of the topography and water, clouds and blue sky are breath taking. We get wonderful sun and moon rises. The Villa is also brand new, solidly built, tastefully decorated with a lot of rich tropical wood. And the pool is a definite plus- hard to keep the kids out of it! Each bedroom equipped with it's own private bathroom with shower. There is also a powder room on the main level off the great room. Air conditioning in all four bedrooms. Laundry room equipped with front loading washer and dryer. Additionally, covered clothesline and great breezes always available to keep towels and swimsuits fresh and dry. Paved road to the property. Easy parking in driveway. Beach chairs and coolers provided. Beautiful location and beautiful villa! We really enjoyed our stay here! The villa was clean, well stocked, and had beautiful views! We loved having a place to come back to after fun days of snorkeling and beach time! The outdoor showers were wonderful. There was a washer and dryer on site with was amazing. We had plenty of space to have large family dinners and play games at night! We had a wonderful time at this villa and would definitely come back!! The house is in a great location overlooking Coral Bay. It’s extremely well maintained and appointed. The kitchen is stocked with all of the utensils, pots, and pans you need to prepare your own meals. Check out Skinny Legs for lunch/dinner and the Pickle for open mic night just down below on the bay. Mark was extremely helpful, responsive and pleasant to work with. We are already planning a return trip. Thanks, Mark! Our 6th trip to St. John and our favorite rental by far. Great views, comfortable, spacious well decorated home. The property manager was quite helpful with tips, etc. Highly recommend it. This is a great house. The furniture and decor is exceptional. The pool and view from it are fabulous. The kitchen is very nice and well equipped. The master bedroom is attached to the living space and is beautiful with a great outdoor shower. The other master and 2 bedrooms do require you to go outside and down steps. They each have a connected bathroom but to leave you have to go outside. Mark was very helpful getting us there and anything else we needed. Coral bay is still recovering so some of the landscape isn't as perfect as it used to be but the locals are so overwhelmingly grateful for tourists, it made us happy to be staying on that side of the island to help them recover. We really enjoyed eating at Skinny Legs, Aqua Bistro and Pizza in Paradise. Some of the nicest people we have ever met. 4 wheel drive is a good idea for getting there and budget car rental at st Thomas airport really stinks. Go with Avis if your renting and actually want them to reserve a car when you make a reservation. It 's a very nice villa. Great views. Mark was nice and easy to deal with. Would stay there again. St. John is wonderful. Lovely home with beautiful view!! NOTE: Pricing is based on number of bedrooms used. VRBO/Homeaway can only auto-quote you our 4 Bedroom weekly rate. Our 1-3 Bedroom rates are below. 1-2 guests________1 Bedroom_______$3200 - $4100 depending on the season 3-4 guests________2 Bedrooms______$3400 - $4300 depending on the season 5-6 guests________3 Bedrooms______$3600 - $4500 depending on the season Christmas / New Year's Week $6000 *Cleaning fee shown is for 4 BR rental. This fee adjusts accordingly for less rooms. *Rates are subject to change until reservation is confirmed.